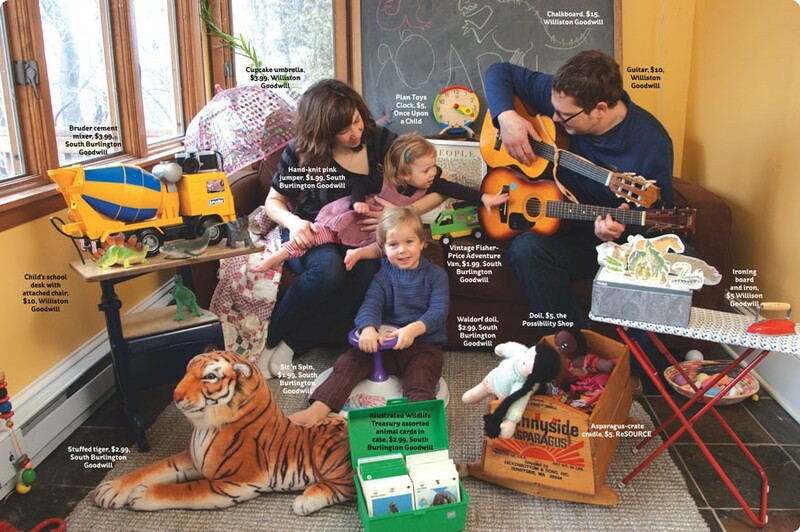 Secondhand Strategies | Features | Kids VT - small people, big ideas! You could easily spend a fortune buying quality clothes and toys for your kids — but you don't have to. Vermont's secondhand stores are full of great deals on used goods. Don't know where to start? We asked three savvy Kids VT contributors to share their thrifting tips and favorite finds. They also recommend some of their top resale shops. This list is not comprehensive; there are many more thrift stores tucked away in small town centers and church basements all across Vermont. But it'll help orient you to the secondhand scene. Keep it handy — you never know when your kid will grow three sizes in one season. How long she's been thrift shopping: Since high school, so approximately 20 years! As a teenager, I shopped thrift stores to find vintage clothing for cheap. I fell in love with not knowing what I might find. It's all in the timing. Thrift stores have better stock during the week. This may be problematic for those of us with full-time jobs, but Goodwill is open until 9 p.m. on weeknights. If you have to shop on the weekends, mornings are best — things are pretty picked over by the afternoon. Check for duds. Test anything you can, and make sure games and puzzles are complete. Be realistic about whether you're going to fix something or replace missing parts. Think outside the box. You can find great things for kids beyond the children's aisles. Fill the dress-up bin with crazy sunglasses, fun belts and colorful scarves. Tablecloths make good drop cloths under messy art projects. Book it. Books are a steal at thrift stores. And if you find a duplicate of a favorite family read, you can frame the illustrations or make popsicle-stick puppets with the story characters. Best deal, ever: I found navy-blue Keen sandals in my son's size for $6.50 at Once Upon a Child — a new pair retails for $50. He wore them every day last summer. Make a list; check it twice. It's easy to become distracted in thrift stores and spend money on items you don't need. Know what you're shopping for before you leave your house — and stick to your list. Buy and sell. Bring your kids' outgrown clothes, toys and books to sell back for cash or store credit. Many consignment shops work on a first-come, first-served basis for sell-backs, so go early. And be warned: Shops are picky about what they accept and will not take anything too worn. Try, try again. Stock changes all the time. If you're shopping for something specific, keep checking back. Persistence pays! Size up the situation. Stores may accidentally mismark clothing and shoe sizes. Make sure to double check the item's actual tag. How she got into thrift shopping: My mom is an amazing thrifter and I caught the bug when I had kids. I realized it didn't make sense to buy most clothes and toys new when I could get great stuff for less money at thrift stores. Buy now, wear later. Don't pass on a great item if it's a little too big for your kid. Buy it and stash it away for next year. Just remember where you put it! Quality over quantity. Look for tried-and-true companies like L.L. Bean, Lands' End, Patagonia and Baby Gap. These items may be a bit pricier than other clothes on the rack, but they'll hold up to a lot more wear. Say "no" to wear and tear. No matter how cheap they are, stained or ripped items aren't worth it. Leave the shopping to the adults. Thrifting requires concentration, which is hard to achieve when your 3-year-old is running up and down the aisles. I end up with a better haul when I'm on my own. Have a little fun. Buying secondhand gives me an excuse to go outside my normal shopping parameters. I've stocked our costume box with some amazing thrifted things, from a gold lamé blazer to a suede cowgirl vest. Buttered Noodles has a vast selection of new merchandise, but its "Consignment Corner" in the back of the store offers gently used items at discounted prices. Consignors can apply 100 percent of their sales toward store credit, or get 60 percent back in the form of a check. Says Coeyman: "It's a great way to turn gear you no longer need into school supplies or birthday presents — sometimes without paying a dime!" Goodwill stores sell children's clothing, toys and books at a fraction of retail prices. They also offer shopping carts to accommodate both your children and your bargains. Pay attention to the merchandise's color-coded tags — each week, a different color indicates a 50-percent discount off the marked price. For $10 a year, a Club Goodwill Discount Card gets you 10 percent off every purchase and a 25-percent discount on your birthday. This shop offers a selection of gently used baby gear and clothing, shoes and outerwear for newborns up to age 16. There are also good-quality maternity clothes. When your baby's born, you can sell those maternity items back to the store by appointment. "I sold back a bag and made $42 in cash — or $63 in store credit," says Loring. Eliza Eaton of the family-resource website Minibury.com recommends this nonprofit, volunteer-run resale shop, which specializes in great-condition maternity and kids clothing. Its amenities include a family playroom, bathroom and changing table. Proceeds benefit other nonprofits that support children and families. The locally owned chain has a big selection of name-brand clothing, shoes, toys, games, books and gear for kids ages 16 and under. Kids can play with toys or watch a movie while parents shop. Once Upon a Child offers a discount stamp card — for every $10 you buy or sell back, you get a stamp. Once you have 20 stamps, you get 15-percent off your next purchase. 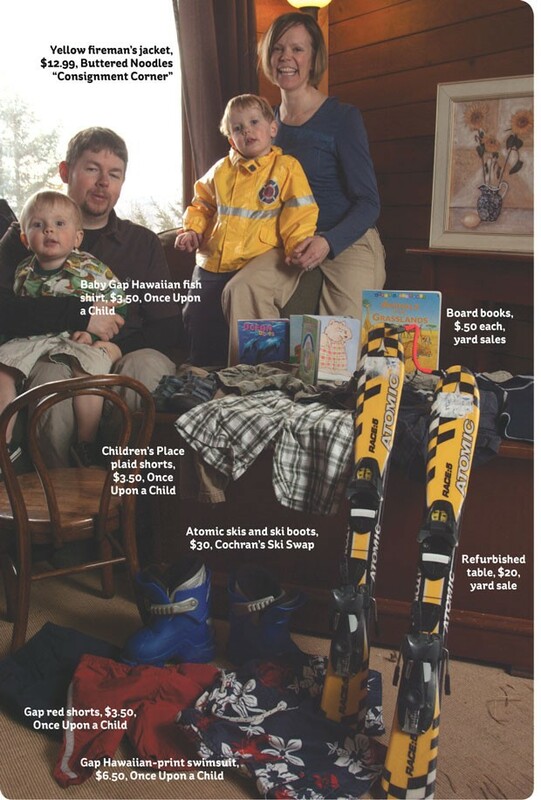 From new and used skis and skates to lacrosse and soccer equipment, you'll find all things athletic at this locally owned chain for adults and children. "Considering how pricey sports equipment is, and how quickly kids grow, it's worth a trip," suggests Novak. "Visiting the Possibility Shop is like hanging out in your super-nice grandmother's basement," says Coeyman of this downstairs store carrying curiosities and, once in a while, vintage toys. "The last time I went, one volunteer read books to my children so that Mommy could 'have a few minutes to browse.' Bliss!" This nonprofit is run by the Burlington United Pentecostal Church. 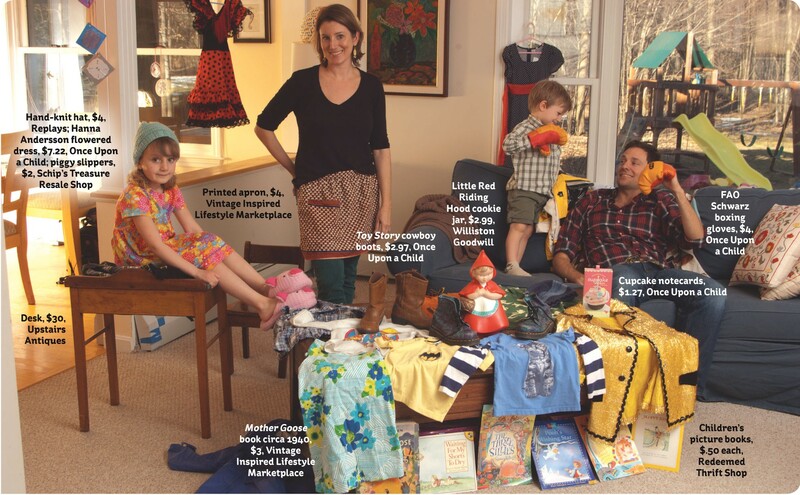 The quality of kids' items varies — "You'll need to pick through to find the gems," says Novak — but the prices are low. In addition to clothing, there's a good selection of kids books, winter gear, toys, games and maternity items. Home to clean, well-cared-for books, toys, household items, and clothing for babies and children, this small resale shop benefits Fletcher Allen Health Care patient programs. "There are lots of breakable tchotchkes, so it's not a great place to bring your children," advises Coeyman. "You have to be willing to sort through toys with missing pieces and broken parts," says Coeyman, but the chaotic store often contains great budget-friendly finds, from soft goods to furniture to a Lite-Brite in its original box. The good-quality baby and kids clothes sold here support community food shelves and projects. "I've scored a vintage sundress for my daughter," notes Novak. If you're searching for a small piece of furniture or decorative accent to dress up your child's room, it's worth trying this antiques shop. 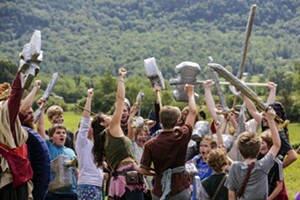 "You'll spend a fraction of what you would at popular kids retailers like Land of Nod or Pottery Barn Kids," says Novak. Among the grown-up treasures at this large antiques and vintage-goods emporium are a smattering of vintage clothes, toys and books for kids. Got another thrift store to recommend? Leave a comment on this story before April 26 and you'll be entered to win a $50 gift card to Kids City in South Burlington.